SEGUIN – After sweeping Friday, Southwestern came from behind to beat #9 Colorado College and easily handled Austin College 3-0 to take the #2 seed of the SCAC Championship. Southwestern started slow and allowed the Tigers to build early leads to pull ahead 2-0, 25-17, 25-21. With their never-say-die attitude the Pirates pulled together and gutted out the extended set three win 26-24, hitting .220 for the set. Despite a just .065 attack percentage in the fourth set the Pirates used tough defense to hold CC to .021 to win 25-23 to for a fifth and final set. As had been all game the fifth set was a nail biter, but the Pirates pulled out the win 18-16 to take the match in thrilling fashion 18-16. Macey Pool led the attack with 15 kills while Abbie Robb added in 14 and Kate Mitchell 10. As a team, Southwestern hit .114 as a team. 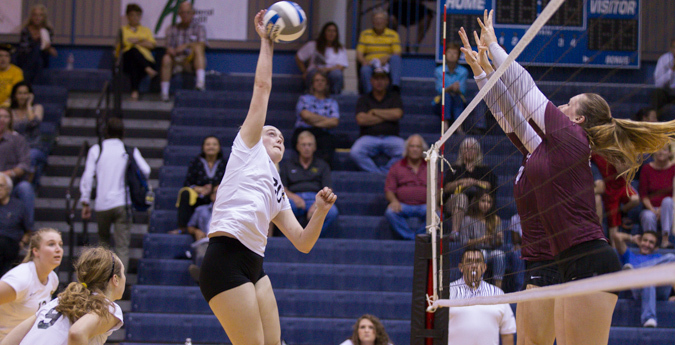 Sydney Rochelle had 23 assists and Nikki Welch 27 as the duo split setting duties. Kaitlyn Foster had a game-high 31 digs and Pool added in 25. Kirby Kincannon had four of Southwestern’s 16 digs in the win. Riding high from the victory Southwestern was firing on all cylinders and posted a .303 attack percentage to win 3-0 over Austin College 26-24, 25-9, 25-22. Olivia Drummond had 10 kills to cap off her dominating weekend. Pool led with 17 digs and Andie Alford and Foster added 12 each. Southwestern improves to 22-8 on the year and 12-2 in the SCAC to move into second place in the conference, just one game behind first place Trinity. Trinity has one final game as they are slated to face Austin College later today. The Pirates return home to host their annual Halloween Invitational. SU kicks off the tournament against Millsaps on Saturday at 7 pm.